Re search shows that social emotional learning is far more important for preschool and early elementary children in predicting later success than mastering academic concepts early. 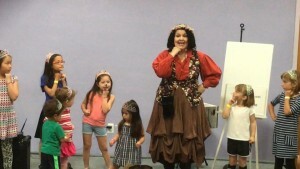 Story songs can be a great way to engage children in social emotional learning in a fun way. Stories improve language development, increase cultural understanding, and develop empathy. Adding music to stories makes them even more fun and makes the stories easier to remember, especially with a catchy chorus to lock in the moral of the story. In traditional fairytales, there is either a child or children whose bad decisions get them into trouble and they have to find their moral way out, or someone has been cast under a spell, cursed, or locked up – usually a princess – and has to be rescued. The good guys and the bad guys are pretty clearly delineated. When I started writing story songs, they were inspired by conversations with kids about traditional fairytale and storybook characters that veered into deeper territory. Is the Dark Knight always the bad guy? Should you summarily sink pirate ships along with the pirates aboard, or should you show mercy? Do princesses always need to be rescued, or are princesses smart enough to get themselves out of trouble? Could unicorns really exist? 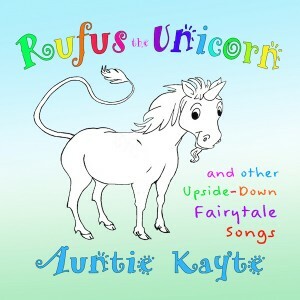 My first CD, Rufus the Unicorn and Other Upside-Down Fairytale Songs, addresses some of these issues, using the power of story to capture kids’ imaginations, and opening the door for discussions that take the lessons even deeper. Each lyric sheet from Songs for Teaching comes with discussion notes. Inspired by a conversation with my nephew and also working with kids who have parents in jail, Pirates Are People Too addresses consequences for bad behavior as well as compassion for people who have done bad things. The discussion notes include a “Crime and Consequences” game. The song, I’m Sorry, models apologizing for unintentionally or intentionally hurting someone, which follows nicely as part of a discussion on how you feel and what you should do if you’ve done pirate behavior. A Princess Can Be Smart encourages girls to embrace both their princess side and their brainy side with a litany of intelligent and adventurous career opportunities for princesses. It also helps break some stereotypical beliefs that boys have about what a girl can be when she grows up, which can be reinforced in follow-up. Rufus the Unicorn is a bit of an ugly-duckling story, where Rufus is ostracized by various animal species before finding his tribe. Children empathize with Rufus not fitting in and even kids as young as three will think about and talk about what they might do if an animal or child who is different wants to play with them. The Cowboy Song and The Cowgirl Song are variations on the same story that encourages both cowboys and cowgirls to value work and play and take an oath to protect those who are weaker. Just like with story books, story songs can lead to different conversations every time you play or sing them as they spark new questions and ideas from young audiences. A special thank you to Auntie Kayte for this blog post.